Compromise: First of all, thank you to all those who live in the new 45th Congressional District in California for your strong support of my reelection. It looks like I will have won by a margin of 18 points in spite of a new district (50% of which I have never represented), a poor year for Republicans and another opponent who spent many times more money than I did and spent it largely on negative advertising. I appreciate your confidence in me. I will not let you down. But, I must confess, it didn’t feel much like a winning night. Frankly, I haven’t been this saddened in a very long time. Yes, I won convincingly, but politics is a team sport. I need friends and allies to get stuff done, and a lot of them lost. The State Board of Equalization collected $1.86 billion in general fund sales and use tax revenue last month, surpassing the state’s $1.74 billion budget estimate. 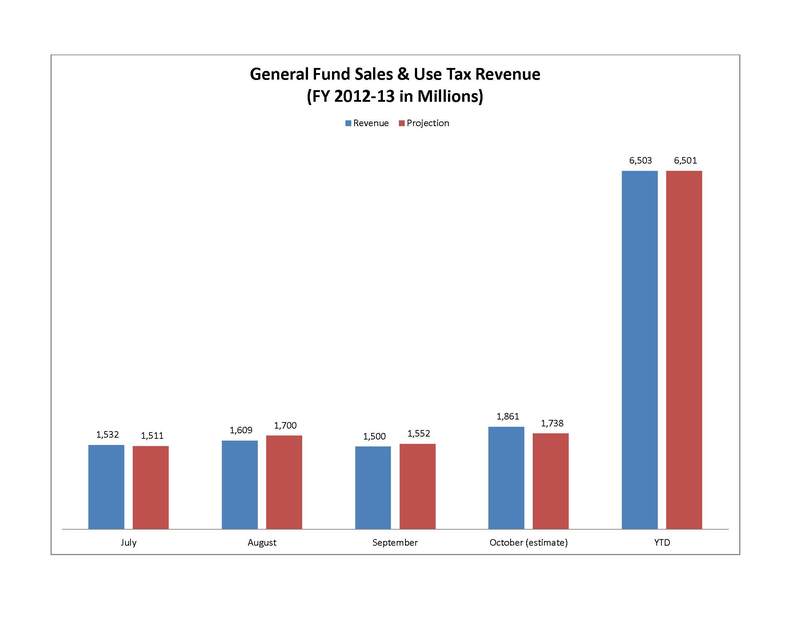 The state’s year-to-date general fund sales and use tax revenues are now meeting projections. From July 1 through October 31, the state received $6.5 billion in revenue, narrowly exceeding the state’s budget projection. October’s revenues came from sales taking place prior to the gas price spike of early October. Retailers must file returns monthly, quarterly or annually depending on the size of their business. Let’s hope that stronger tax revenues are a reflection of a recovering economy rather than merely the result of higher prices. It’s bad enough that California’s gas tax is among the highest in the nation. It’s even worse that the gas tax goes up whenever gas prices rise. Today I released data showing that high gas prices have resulted in a record windfall for government at the expense of California consumers. California motorists paid a record $8.3 billion in state and local fuel taxes during the 2011-12 fiscal year. 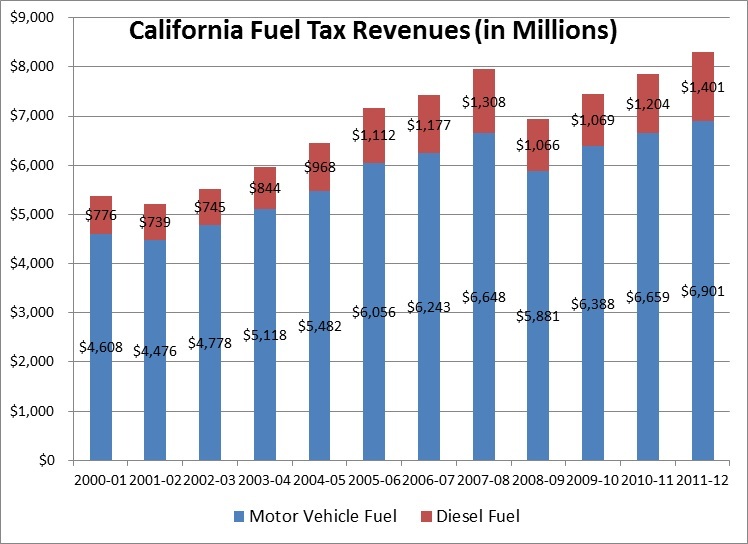 From July 1, 2011 to June 30, 2012, the California State Board of Equalization collected $6.9 billion in motor vehicle fuel taxes, up from $6.7 billion the prior year. Excise tax revenues accounted for $5.2 billion, while sales tax revenues accounted for $1.7 billion. Over the same time period, the state collected $1.4 billion in diesel fuel taxes, up from $1.2 billion the prior year. Excise tax revenues accounted for $343 million, while sales tax revenues accounted for $1.1 billion. A World of Debt: It is no surprise to readers of these pages that we have a debt, spending, deficit and growth problem in the United States today. What you may not know, however, is that the rest of the developed world is suffering from the same malaise, albeit to different degrees. And, the causes of said malaise are the same the world over, again with variations only in degree. But, what is really disturbing is that governments around the world seem to be implementing exactly the same “solution” for the debt, spending, deficit and growth problems that abound everywhere. It’s disturbing because this “solution” will not work – at least it won’t work without potentially severe side effects that may make the medicine as bad or even worse than the disease. It’s too early to know for sure, but so far sales tax revenue this year appears to be largely on track to meet the state’s budget needs. The latest general fund sales and use tax revenue numbers show that from July through September the State Board of Equalization received $4.64 billion in revenue. That’s just two and a half percent shy of the Department of Finance’s budget projection of $4.76 billion. Of course, I can’t help but think that if more Californians had jobs, these revenue numbers would be even stronger. The latest numbers do not reflect the recent spike in gas prices. And those high fuel prices have the potential to create a tax windfall for state and local government. Earlier this year I proposed legislation capping rising fuel taxes. Unfortunately, it failed to gain traction in the Legislature. In order to stimulate the inert economy, we now have the government investing in government. The public sector is trading public dollars for public dollars. “How will you spend your future?” the California State Teachers Retirement System logo asks. I wouldn’t spend it on a solar plant. Nor would I voluntarily spend my future with CalSTRS. 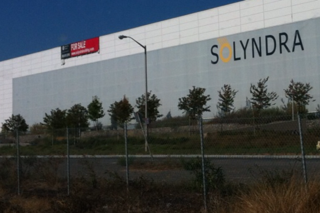 Nearly every time I pick up the newspaper, the headline screams that another solar plant has closed and the business gone under. Yet I see that the California State Teachers’ Retirement System is investing $42.8 million in a large solar plant in Sacramento. Today, the Howard Jarvis Taxpayers Association filed a class action lawsuit against Jerry Brown and the Legislature to overturn the unconstitutional Fire Tax. As one of California’s elected tax officials, it’s my responsibility to use my elected office to ensure that taxpayers are treated fairly. Accordingly, I commend the Howard Jarvis Taxpayers Association for bringing together Californians from every walk of life and region of our state to right the wrong that is the fire tax. The Governor and Legislature’s willingness to impose such an unfair and regressive tax in direct violation of the Constitution should serve as a wake-up call for all freedom-loving Californians. With all of the focus on the November ballot initiatives to raise taxes, Proposition 31 seems to have quietly avoided heavy scrutiny in the main stream media thus far. But this initiative is a wolf in sheep’s clothing, pretending to be much-needed reform. There is growing confusion about ballot title and summaries on California’s ballot initiatives. It’s almost impossible to know how to vote on something. A “no” vote may mean “yes,” and visa versa, given the way the California Attorney General’s office plays fast and loose with writing the titles and summaries of ballot measures. This is the case with Proposition 31 –what’s up is down, and what appears to be reform, is not. Equally disturbing is how so many of the state’s newspapers are jumping on board this phony “reform” measure. Even the California Republican Party officially endorsed Prop. 31.